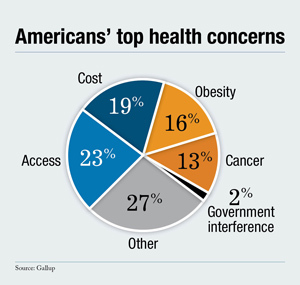 Americans say health care access is the nations most urgent health problem, according to a new Gallup poll. Thats followed closely by the cost of health care and obesity. Americans say health care access is the nation’s most urgent health problem, according to a new Gallup poll. That’s followed closely by the cost of health care and obesity.